We’re all pretty obsessed with how adorable the Bookstore Day logo is. What: Extraordinary exclusive books and literary posters and swag; as well as events at local stores, all celebrating the art of the independent bookstore. Ok, this isn’t our typical destination outing, but it’s one I think we will look forward to for years to come. In an age where retail giants dominate the market, it’s becoming rare that people peruse tiny locally owned shops for their literary needs. I know I’m guilty of spending all my book money on Amazon – though I don’t happen to live near too many independent bookstores. California Bookstore Day, much like the nationally-run Record Store Day, celebrates these small shops, in hopes to drive readers to support their local bookish businesses. It’s a worthwhile cause – after all, your local bookstore is more likely to give you the special treatment – like knowing you by name and who your favorite authors are – than amazon.com. Well, I guess Amazon does know my name and what I buy, but that’s just because they are robots! Independent bookstores are often owned by passionate readers who are just as likely to have a friendly chat with you about local news as they are to recommend your next favorite author. 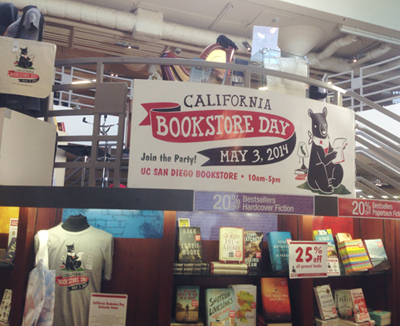 We spent a gorgeous day out in La Jolla to scope California Bookstore Day. 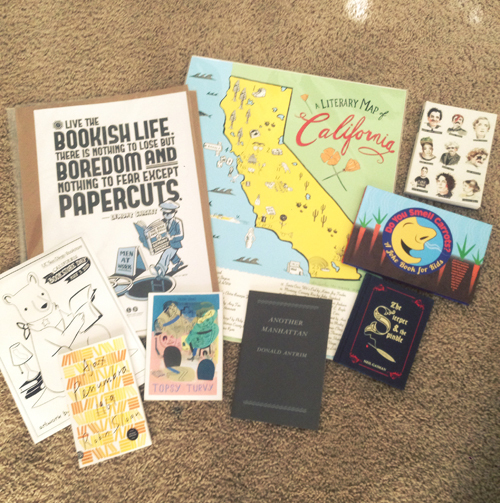 At the UCSD Bookstore, we scored the gorgeous Literary Map of California and Neil Gaiman’s retelling of a classic fairy tale, and caught a bit of San Diego-themed story time. At Warwicks, we just missed a signing by author Brian Selznick, but arrived in time to score some Lemony Snicket’s “The Bookish Life” posters, perfect for that office we might someday have. We heard about book-themed drinks, raffles, poetry readings, arts and crafts, Mad Libs and more at other locations. All in all, even if it wasn’t California Bookstore Day, I think you’ll find heading to your local shop is a joyful experience, one full of mystery, intrigue, and fun. What am I going to read today?? Your local bookstore owner can tell you. Here’s hoping that small bookstores thrive in the future, and that California Bookstore Day comes back next year (and eventually spreads to other states! ).